The Hotel lies 150 meters from the ocean on a quiet side street. Bars and nightlife is about 100 meters from the hotel. 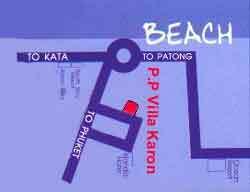 And there you can grab a tuk tuk ”Thai taxi” to Patong which lies 10 km north. Kata and Kata Noi beach lies 2 km south.